It’s been a great start to the school year, guys! Keep up the good work! This is September’s edition of the KT Key. Please send me some feedback on what I could add or change. Suggestions are always welcome! 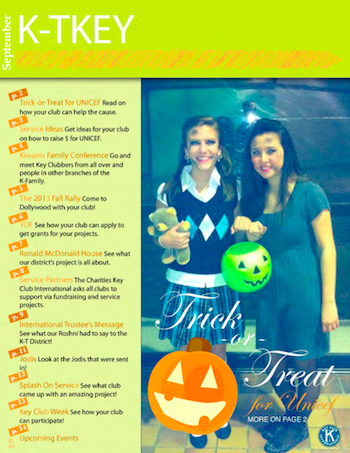 This issue focuses on Trick-or-Treat for UNICEF, the Kiwanis Family Conference, Fall Rally, the Youth Opportunities Fund, Ronald McDonald House, and Key Club Week. There is a special spotlight on service too! Check it out!